Tony Spain is a former Golden Glove Champion, undefeated 4 time Toughman Champion and a former Professional title contender. Along with his 25 years of boxing experience, Tony is a Sanctioned USA Boxing Coach, a Licensed Florida Boxing Trainer, a Certified Personal Trainer and Sports Nutritionist. 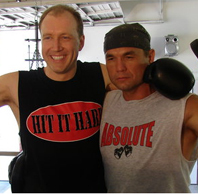 Tony has trained and represented professional boxers and on the Board of Directors of Kickboxing Fitness Institute, American Strength Training Institute and Bone Crunch Fighting and is President of The Boxing Fitness Institute. He has currently completed the Cross fit Striking Certification Course. Our assistant trainers are Sanctioned USA Boxing Coaches, Licensed Florida Boxing trainers by the Florida Boxing Commission and CertifiedBoxing Fitness instructors. All have obtained Advanced Certification through the Boxing Fitness Institute. Our trainers specialize in proper technique fundamentals and having fun!